This Shabbat, at Yom Kippur, we will mark Yizkor, a service of remembrance, of honoring the dead. Last Saturday night, I awoke around 2 am, remembering how we buried my sister, Suzie. That enormous mound of earth, the dark, deep hole. Suzie died of cancer. Her youngest child was only three. I did not speak when we buried her. I did not know how. In the immediate aftermath of death, life is undone. The world of the living persists but its existence is surreal. We long for our beloved; we are conscious only of our loss. 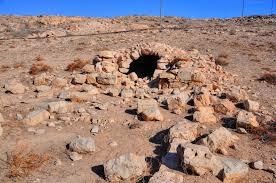 Our mourning takes place in a ruin. No language suffices. And yet, we must speak in order to heal. Centuries ago, when mourners appeared in synagogue, heads and faces covered, the service leader turned to congregants and insisted: “Demand the reason!” “Demand the reason!” Mourners were asked to speak, to explain. It is easy to retreat from the face of pain. But this ritual made turning away an impossibility. We may not ignore those wrapped in grief. Listening, we help a mourner open the heart. We honor longing and despair. We acknowledge denial and anguish. Demand the reason. The rabbis knew that grief is many-faceted. All the behaviors of mourning are those, they say, of the ninth of Av. Mourners are directed to the Book of Lamentations, a book which records the horrific siege of Jerusalem, the destruction of the First Temple, the exile. Are you grieving? The rabbis suggest reading a raw text of anguish. Why? Encountering the pain Lamentations describes gives us permission to acknowledge our own. It is another way to demand the reason. The rabbis added a text not of rage or defiance, nor of grief and sorrow to the rituals of mourning. Mourner’s Kaddish, inscribed into our practice in the Middle Ages, is a song, a musical text of pure, unmitigated praise for the Divine. At the time of loss, one says nothing about it. In the face of death, one praises the Source of Life. Our texts do everything from indicting to praising the Holy One. Lamentations gives us longing and despair – but also resistance. Mourner’s Kaddish offers laudation. The central phrase y’hei sh’mei raba m’vorach l’alam ulal’mei almayya (may God’s great name be praised) is considered, so the rabbis, the very foundation of the world. Despite the ruin, affix and affirm the existence of the earth: y’hei sh’mei raba We remain in conversation with God, co-creating the world. We find our voices, we utter words. “Weeping, she makes weep,” reads Lamentations Rabbah. She weeps and the Holy One weeps with her. The ministering angels, heaven and earth, mountains and hills weep with her. Everything in the created world joins together and laments. We communicate through tears. No one is alone. A distressed people builds again, praises again. Such is a fact of Jewish life. No devastation – not even the Shoah – silences the survivors utterly. Read Lamentations, the rabbis say. Recite y’hei shemay raba. It is a paradox that sustains us. It is a paradox that permits voicing all we feel. We mourn as our hearts must, in whatever way they must. To speak from our grief; to act on what we know: Deep and profound remembrance of those we have lost will lead us to sanctify and honor life. In this year, with hearts and eyes turned to the terrors and the horrors unfolding in our own time, we must ourselves demand the reason. Recognizing lament, responding to the imperative of praise, we must find inspiration to act. For a more peaceful world – for a more loving world. For a world in which we may speak – gently, with compassion and understanding, and, in so doing, heal. Don’t calm your friend in the time of his anger and grief. And don’t comfort him when (his loved one’s) corpse is placed before him. My mother-in-law, Evelyn, was a Protestant. She was born in the Ore Mountains of Germany, a region known for the production of colorful nutcrackers and Christmas carousels powered by the heat of slim white candles. Typically, the carousels carry the lightest of singing angels, and, of course, a nativity scene. When Evelyn gave us such a gift, she carefully and delicately chose only the tiny deer, trees with balsam wood curlicued into branches, and folk figures for us to place on its discs. Evelyn knew tact. The Ore Mountains are known for other handicrafts, including feather-light bobbin lace made with dozens to hundreds of individual threads. Evelyn taught herself the craft after her family escaped the Soviet occupation of eastern Germany. One of her most exquisite works was an altar cloth for her church. I saw the piece when she was visiting and we went shopping for linen to match the snow white border. The lace was patterned with hearts. Inside each heart was a cross. Evelyn died last summer after what was supposed to be a routine operation to lance a cyst that had grown near her heart. For many years, and as often as we could manage, I sent my husband, Ralf and our son, Erik to Germany to visit Evelyn. We didn’t have the resources to go as a family. The spring before she died, I had started squirreling away money in secret. I wanted to surprise my family – and Evelyn – with plans to visit the following year. I’d even started checking potential dates of departure to see how air fares compared. There were years when I had lived just two hours or so from Evelyn. Then, we saw each other often. In those days I would bound up the stairs to her second-floor apartment, beating her own son to claim a first hug. I loved Evelyn as, I think, Ruth loved Naomi. We were two utterly different natures. I have never known how to sit still unless I am reading. I want a lot from the world, though what I want mostly concerns understanding and human decency. Evelyn was calm, quiet, and expected little. “Why not dream?” I asked. “I never do that,” she said. Perhaps Evelyn couldn’t dream because she had been born into Hitler’s Germany, a land that had made nightmares real. Evelyn loved our Jewish family with grace and understanding. She came to love our congregation, too, and never failed to ask me about the members she had met when visiting America. “How are the Kingbergs?” she would ask, and I would tell her that 86-year-oldArthurwas still getting up at the crack of dawn to garden while 86-year-old Ruth Kingberg continued to begin each day by lifting small (but significant) weights. Evelyn had a voice like a girl’s. Some of my sweetest memories are the stuff of clichés: Evelyn, singing as she scrubbed the pots in her cramped kitchen; Evelyn singing old folks songs about chimney sweepers and winter snows and high mountains. Once, for fun, we sat together and sang “Shabbat Shalom” and “Shalom Aleychem.” It was just weeks before Erik’s bar mitzvah, where she sang right along with the rest of us. She learned new songs and prayers quickly, no matter the language and regardless of faith. 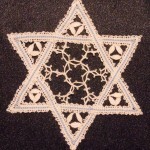 In recent years, she began making me lace Stars of David. I sewed them onto kippot and gave them to my closest friends. I have two such stars left. I do not think I will be able to give them away. Jews have many exquisite and life-affirming rituals around mourning. We don’t demand that mourners “move on.” Instead, Judaism creates avenues for making memories, for holding our loved ones to us after they are gone. During the first, wrenching week of shiva (seven), we sit with mourners. The rabbis remind us not to try to comfort the bereaved but simply, kindly, to listen. The mourners will naturally, inevitably tell stories about their beloved one, and in the telling, make a blessing of the loved one’s name. At the end of the week, the mourners are taken outside to walk around the block, to find their feet and the earth beneath them, to try to rejoin the world of the living. Their steps may be reluctant ones. 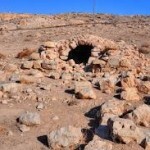 During shloshim (thirty), the month following the burial, the community acknowledges that mourners are still relearning the way of the world. Jews say Mourner’s Kaddish for eleven months for parents, children, even, nowadays, those whom they simply loved beyond measure. At the close of the first year of mourning, we hold the first of many annual yahrzeit services, where we pray in honor and memory of the one we have lost. We light a candle that burns for a night and a day, tell stories, join with others for comfort and remembrance. At annual festivals we recite memorial prayers in honor of our loved ones. For Evelyn’s yahrzeit we will, among other things, go to the American mountains she loved. There, in the Blue Ridge Mountains we will lay out things of hers. We will remember her and be blessed by our memories. We will recite Mourner’s Kaddish and El Melay Rachamim. 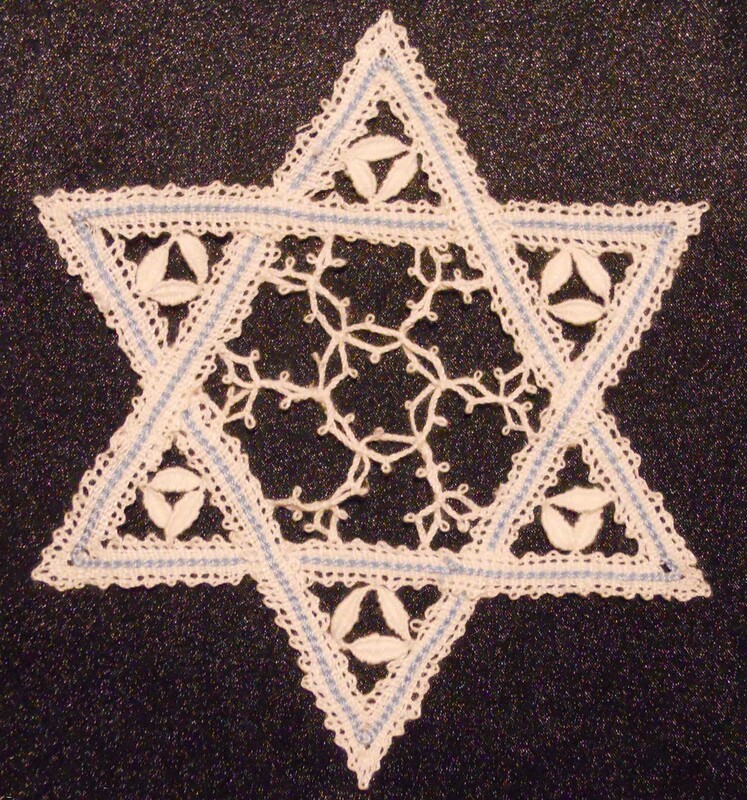 Before me will be the lace Stars of David, their blue and white threads woven by my patient mother-in-law. In my mind’s eye I will also see the altar cloth of hearts and crosses. Her hands made symbols of both our religions. Grief, like love, transcends all boundaries. Both exist in respect of persons; neither is limited by differences. To my Lutheran Naomi: My grief is my love.